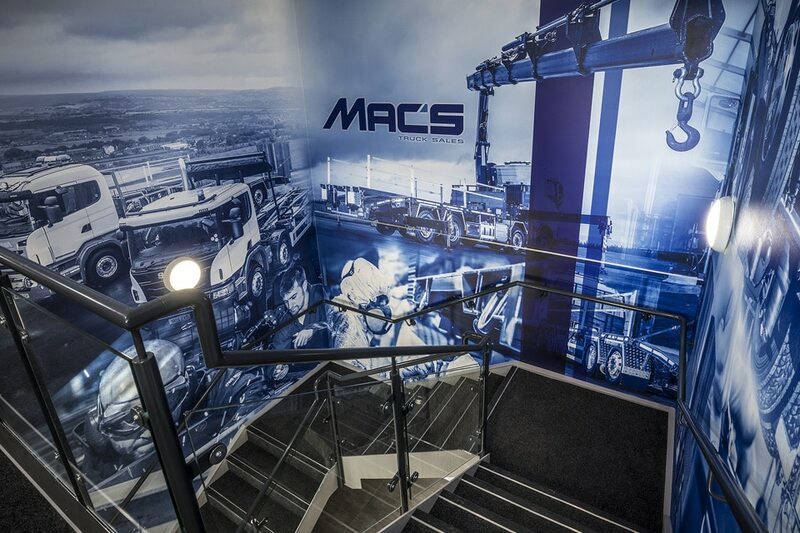 Mac’s Trucks is a long-established company spanning nearly five decades, it’s success owing to an amalgamation of best practice, innovation and professionalism. We are able to offer our customers complete control of crafting their ideal vehicle and assisting in any aftersales care thereafter. Part of Mac’s USP is that it is a one stop shop for our customers, that we deal with the entire buying, building and aftersales care in house – as such, our primary business activity is the production and manufacture of HGV vehicles. This encompasses niche products such as Tippers, Crane & Plant, Curtainsiders, Box Vans, Beavertails, Cheesewedges, Skips & Hooks. We are well known for our Removal Vehicles. We ensure our product range represents all the key brands and accommodates all budgets; Scania, DAF, Volvo, Mercedes and Iveco. We believe that our site has become a real destination within the HGV market; its aesthetics, it’s location and what we offer. We strive to appeal all the senses, being able to physically see, tangibly touch and hear the growl of a V8 engine. We want our customers to feel special, despite being one of the more expensive products on the market, we often beat out cheaper competition because when it come to purchasing a vehicle of this nature – people prize quality over quantity. Whilst a ‘Mac’s Truck’ is a triumph in the marketplace, in which we receive positive feedback from both prospective and existing customers alike. The manufacture of an accomplished bespoke end product, only attributes to part of our success. Engrained in our very foundations, a successful sales team with good customer relations has proven an integral element of the longevity and prosperity seen in our business over the last 45 years. A family run firm, spanning almost three generations that upholds traditional values whilst adopting modern methods. You are welcome to visit our custom built workshops with state of the art equipment and paint booth.